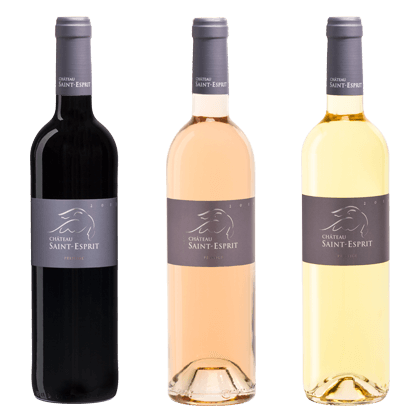 Château Saint-Esprit wines are an invite to share Provence, a promise of an immediate pleasure. They will bring you the sublimes landscapes of its countryside hills as well as to the Azure blue of the Mediterranean Sea. Under a stunning sunshine, you will match them with the local specialties such as a fresh goat cheese, a tomato salad and its freshly pressed olive oil dressing, a tapenade or a morning caught fish. From its magnificent Terroir, our wines express great conviviality. Each sip will make you dream of a pleasant destination, an invitation to travel and share. The “Essentiel” cuvee is characterised by its freshness, its crispiness. Vinification and aging in stainless tanks are chosen, in order to preserve and enhance fruity characters. This cuvee is elaborated with the typical Provencal varietals, with a majority of Grenache for red and rosé and Rolle in the white. These wines are great pleasure wines, designed to be consumed without waiting. The “Prestige” cuvee is historically the flagship of Château Saint-Esprit wines. 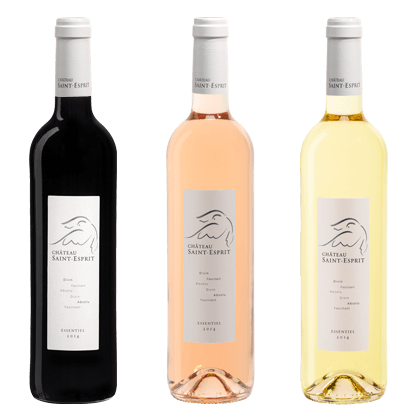 Made in the three colours, these wines are the perfect representation of the Provence vineyard. The grapes are delicately selected within some of the oldest vines of the vineyard. The wines are made of typical Provence blends using Mourvedre, Grenache, Syrah, Cinsault and Rolle in the pure Provencal tradition. This cuvee is as well as the greatest known of Château Saint-Esprit, a beautiful expression of the typical characters of the Provencal Terroir. These wines show strength and robust characters without brutality. 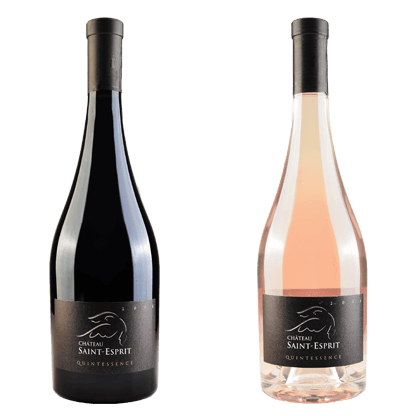 Since the 2013 vintage, Richard Croce-Spinelli elaborated a new cuvee in very small volumes, with the top best rows of the best blocks of Château Saint-Esprit vineyard. Thus, the “Quintessence” cuvee reflects the most refine characters of our 60 year old vines Mourvedre, Syrah and Cinsault. This cuvee is elaborated for complexity, elegance and finesse. A perfect balance between strength, texture and aromatic structure. Looking for excellence, the vinification of these wines is long. Thus, the red is aged for 14 months and the rosé for 6 months in our best French barrels. This winemaking approach enhances a complex and delicate aromatic structure and a great texture, rich and savoury, which matches food wonderfully – two delicious gastronomic wines. They will definitely gain complexity maturing but may prove difficult to cellar, due to their appeal.